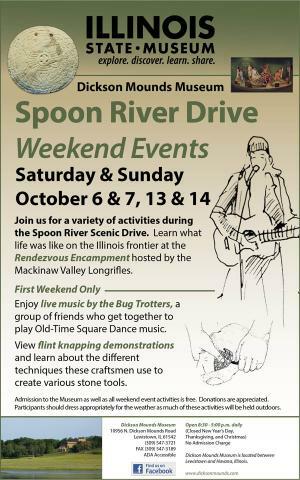 Dickson Mounds Museum is a stop along the Spoon River Valley Scenic Drive. Visitors may enjoy the Museum's three floors of exhibits, observation deck overlooking the Illinois and Spoon Rivers, and the grounds. Learn what life was like on the Illinois frontier at the Rendezvous Encampment hosted by the Mackinaw Valley Longrifles. Admission to the Museum as well as all the Rendezvous Encampment is free. Donations are appreciated. Participants should dress appropriately for the weather as much of these activities will be held outdoors.